MEETING REPORT. TRANSGENIC ANIMALS AND GENETIC ENGINEERING TECHNIQUES. 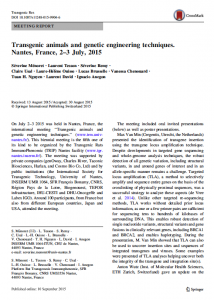 The international meeting Transgenic Animals and Genetic Engineering Techniques (http://www.trm.univ-nantes.fr) was held on July 2–3 2015 in Nantes, France. This event, organized by the Transgenic Rats ImmunoPhenomic (TRIP) Nantes facility (http://www.tgr.nantes.inserm.fr) and co-sponsored by the ISTT, gathered around 100 participants from France, as well as other European countries, Japan and the USA. The meeting gave participants the opportunity to update information on techniques and models in transgenesis and genetic engineering. The meeting encouraged students and scientists to expand their knowledge on the potential applications of new techniques to their own models or to apply them to related pathophysiological models for analysis of genes or diseases using genetically modified animals. Thanks to the organizers and presenters for having made this fifth edition again a huge success! We invite you to read the report recently published online in Transgenic Research (http://www.ncbi.nlm.nih.gov/pubmed/26358113) [authors: Séverine Ménoret, Laurent Tesson, Séverine Remy, Claire Usal, Laure-Hélène Ouisse, Lucas Brusselle, Vanessa Chenouard, Tuan H. Nguyen, Laurent David and Ignacio Anegon]. Author Benoit KanzlerPosted on September 18, 2015 Categories Meeting reportLeave a comment on MEETING REPORT. TRANSGENIC ANIMALS AND GENETIC ENGINEERING TECHNIQUES. The official results of the recent election for the ISTT Board of Directors are in, and we congratulate Branko Zevnik, Lynn Doglio and Peter Hohenstein on their election to the ISTT Board. Branko Zevnik (Cologne, Germany) is the head of the in vivo Research Facility at the University of Cologne. Lynn Doglio (Chicago, USA) is the Director of the Transgenic and Targeted Mutagenesis Laboratory at Northwestern University. Peter Hohenstein (Edinburgh, United Kingdom) is a Group Leader and Chair of the Small Animal Facility Management Committee at The Roslin Institute. All three candidates received the support of the majority of voting ISTT members. While they will start their three-year terms at TT2016 to be held in Prague, Czech Republic, they will be immediately appointed as Board members-elect. This will allow them to interact with the rest of the ISTT Board members and become familiar with the administration and management of the ISTT. Congratulations to all of them! In addition, the ISTT would like to express its respect and sincere appreciation for the commitment and participation of all the candidates who were involved in the ISTT election process. As well, we would like to thank Tom Fielder, Wojtek Auerbach, and Boris Jerchow for their service on the ISTT Council and Board of Directors. These three Board members have contributed greatly to the management of the ISTT (and will continue to do so until TT2016). It is due in large part to the contributions of our members that we have the vibrant Society that we do.